There’s lots of support in the Connecta Chat group on Facebook if you can’t find an answer to your question here! Connecta Chat is a great place to share photos and Connecta experiences with other Connecta fans, too. Visit Connecta Chat here. Can I carry my newborn baby in a Connecta baby carrier? Yes, you can! The award-winning Connecta baby carrier is safety rated from 7lb, so as long as your baby weighs 7lb or more, you’re safe to use the Connecta baby carrier to carry your new baby. You’ll need to use the accessory strap to cinch the base of the carrier in, so that it doesn’t overspread your baby’s legs. Follow the instruction booklet, and you’re ready to step out with your baby in style and comfort! Can I back carry in a Connecta carrier? Yes, you can carry your baby on your back in your Connecta baby carrier! We recommend waiting until your baby is 6 months or older, and sitting unassisted. Your baby should also comfortably fit the carrier without cinching the base in, and with the main fabric panel just reaching the nape of baby’s neck and no higher. Standard straps or petite straps – which should I choose? The “petite” refers to the padded length of the shoulder straps, rather than the width or amount of padding or size of the carrier itself. Petite straps have 2 inches shorter of padding than standard straps. Standard straps will fit almost everyone for front carries. Petite straps fit most people for front carries too, although it’s worth checking whether you may benefit from the additional 2 inches of overall length if you wear larger sizes in clothing on your upper body. For back carries, the petite straps give you a wider range of tightening on the shoulder straps which may be helpful for petite adults. 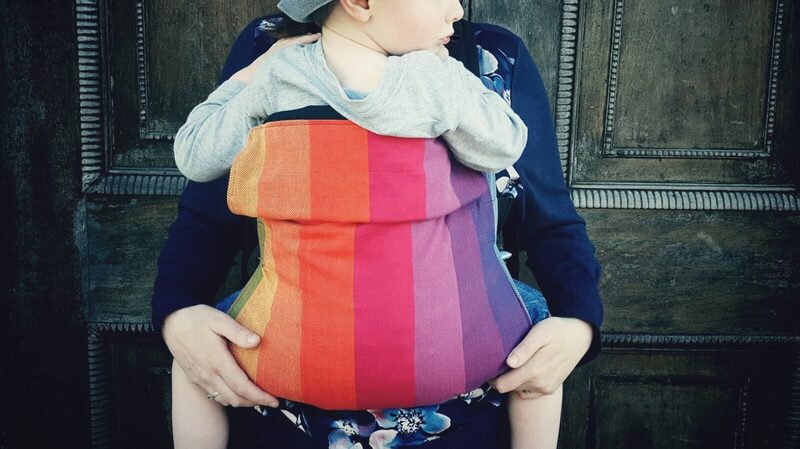 Many Connecta baby carrier customers who are shorter in stature and/or a smaller clothing size (UK size 10 or under in women’s clothing) find the petite straps useful for back carries. However, standard straps can work for a comfortable back carry for everyone too, depending on how high you were the Connecta baby carrier on your torso. You can also use to the accessory strap to bring the shoulder straps in closer on your chest, they “shortening” the shoulder straps and giving you a tighter fit. You’ll need the accessory strap for a back carry for standard and petite straps, as it keeps the shoulder straps in place on your shoulders and prevents them from slipping off. Where are Connecta baby carriers and toddler carriers made? All Connecta baby, toddler and preschool carriers are made to very high quality standards in the Czech Republic. Elmer & Zweifel, the Connecta carrier manufacturer, is based in Germany and their Connecta sewing units are in the Czech Republic. Your new Connecta baby carrier is carefully sewn every step of the way, and given a final quality check when it’s folded and packaged. Help! The straps on my Connecta carrier ride up to my neck. How can I stop this happening? Can I breastfeed in my Connecta baby carrier? The great news is that yes, you can breastfeed in your Connecta baby carrier! The Connecta carrier is simple to breastfeed in, and the simplicity of the design means that you’ll quickly get used to loosening and tightening the straps for breastfeeding. You’ll always carry your baby in an upright position in your Connecta baby carrier. Once your baby has good head control (generally around 4 months), you can loosen the waist and shoulder straps slightly, shuffle the whole carrier and baby down to your breast. Re-tighten the waist band. This enables your baby to reach your breast to feed. Once baby has finished feeding, always move baby up higher to ensure that your baby’s airways are clear. Tighten waist and shoulder straps, and carry out your safety checks. I’m a plus size mama – will the Connecta baby carrier fit me? When you’re looking online for a baby carrier, it can sometimes be difficult to find out whether a particular baby carrier will be a good fit for your shape and size. The Connecta carrier fits a wide range of sizes. The waistband on the Connecta baby carrier fits up to a 56 inch waist, and we’ve had feedback from plus size customers that their Connecta is really comfortable for them. the lack of padded waistband means that you can adjust the waist to sit in the position that’s most comfortable for you. How do I look after my Connecta baby carrier? To prolong the life of your Connecta baby carrier, just spot clean with water or a very gentle soap and water (no detergents! Washing up liquid isn’t suitable, nor are baby wipes as they normally contain alcohol). If you do need to wash your Connecta carrier, close all the buckles before putting it in the washing machine. We like to pop ours into a pillowcase, too, before washing. Wash on a gentle cycle, at 40 degrees. Avoid using fabric softener as it can make the webbing slippy. Air dry outside or inside. Do not tumble dry. What are Connecta teething pads for? These are perfect for keeping your shoulder straps clean, meaning you can wash your carrier less often and help it to last longer.